Maruti Ciaz price in Mumbai starts from Rs. 8.19 lakh (Ex-showroom). Ciaz is available in only 14 variant. 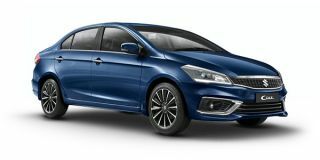 Maruti Ciaz's top competitors are Honda City (price starting at Rs. 9.91 lakh in Mumbai) and Hyundai Verna (price starting at Rs. 8.08 lakh in Mumbai). Share your experiences with Ciaz? Q. How is the after sales service from Hyundai for Verna and what is the cost of servicing? How is the durability and longetivity of Verna as compared to Ciaz? Q. Which sedan car is best value for money? Q. Which car is better under 10-12 lakh with sunroof? Q. It is available in Hospet? Q. Which petrol car with auto gear shift option is good to buy within 10 to 12 lacks budget range? Q. Which is the best car in terms of quality and price between City and Ciaz? Confused about Maruti Suzuki Ciaz?